I bought this 7” while in Tokyo. 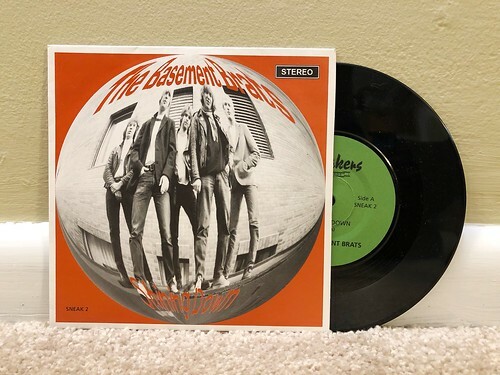 I was not familiar with The Basement Brats, but I’m always happy to take a chance on a 7” that might lead me to something new that I might like. Since these guys were also from Norway and this came out in 1996, it seemed to me that there were enough positives in favor of picking it up. I can say without hesitation that I really like the A side “Shining Down.” It’s got a power pop vibe to it, with slick guitar riffing and nice vocal melodies that really help to drive home the hook of the chorus. I was pretty excited about this record after that song finished, but my opinion changed a bit when I flipped over to the two songs on the B side. The first one, “It’s Not The Right Time,” is more of a straightforward garage rock song, with those weird lead guitar licks and the ‘oh yeah!’ kind of shouting that has never been my bag. The second song is “Disconnected Love” and that one is closer to what I like. In fact it sits right in the middle of the two other songs, poppier than “It’s Not The Right Time,” but garage-ier than “Shining Down.” But there’s a guitar solo I’m not particularly keen on that drags the song down a bit. The A side is good enough that it was worth the purchase of this 7” by itself. I’m just not sure if it’s enough to make me take a chance on some of this band’s other records. If they have albums full of songs like the B side of this 7”, that’s probably not something that I would listen to all that much.